We were leading Nancy’s high school camping club on a three-day adventure. As is customary, we took these students on a hike the first night after dinner. Golden silk spiders (Nephila clavipes) get their name from the color of their silk, not their bodies. 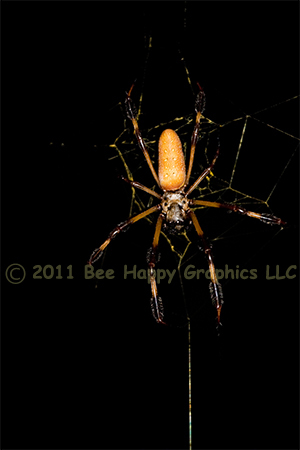 They are also called golden orb-weavers or banana spiders. This species can be found from North Carolina through Louisiana. The much-larger females (about two inches for the body alone) usually eats its mate. Photographic details: Canon EOS 20D camera w/ EF 100-400mm f/4.5-5.6L IS USM lens set at 400mm. Flash was used. Camera was on f/5.6 for 1/60 sec at ISO 400. Fine Art Paper 14" x 11" 181/2" x 13"
Canvas N/A 241/2" x 17"